Park McArthur, Poly (2016). 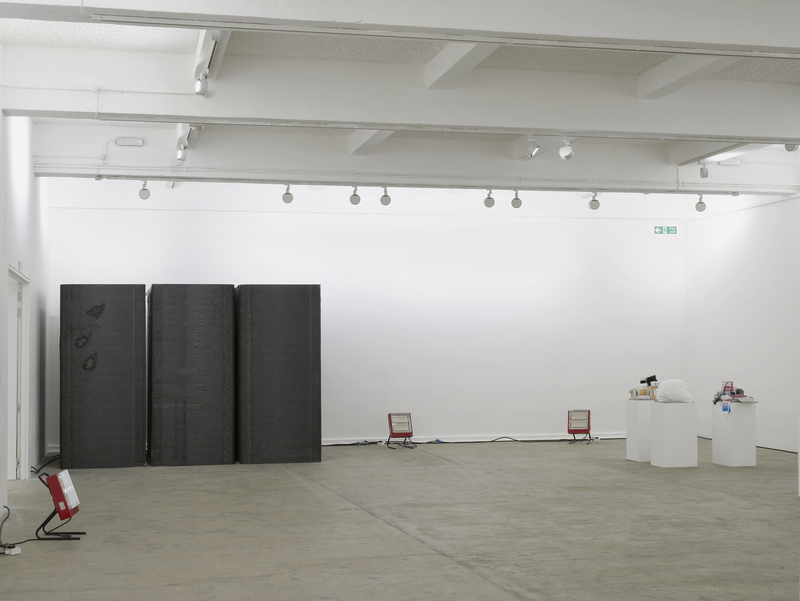 Installation view, Chisenhale Gallery, 2016. Courtesy of the artist and ESSEX STREET, New York and Lars Friedrich, Berlin. Photo: Andy Keate. 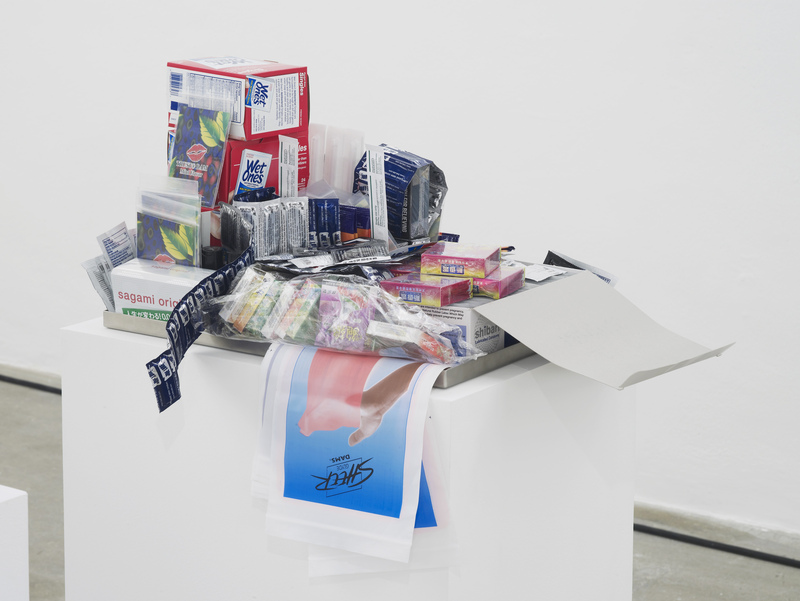 In a public conversation between Park McArthur and Isla Leaver Yap that accompanied the former’s exhibition Poly at the Chisenhale Gallery, London, a member of the audience shared her experience of the show. The feeling that arose when she approached the installation was similar, she said, to that of making eye contact with an acquaintance as you approach each other across a room. There is an awkward gap that arises when the walk becomes too long to hold the gaze, and you are forced to look away. 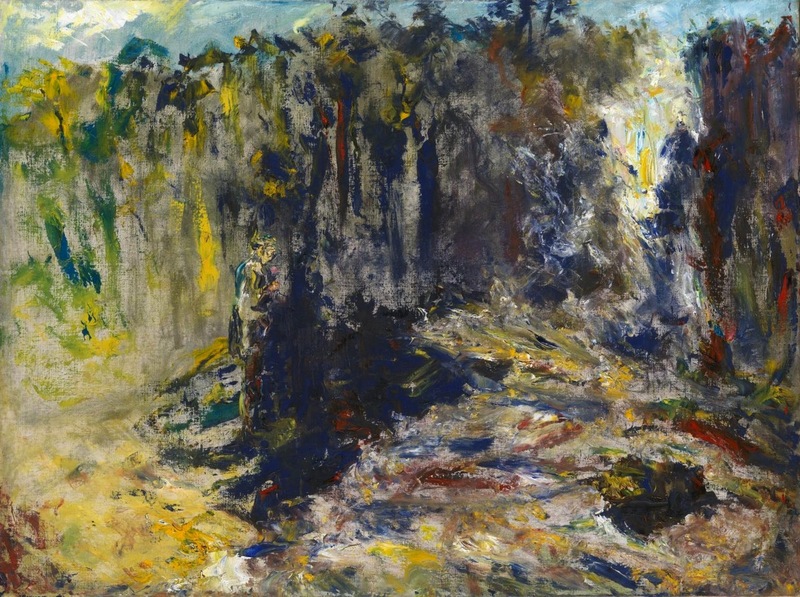 Her comment suggests that we experience McArthur’s work as a social encounter, and speaks to an important objective of the artist’s practice – to reveal and work with the larger social structures in which the work is being made, exhibited and cared for. McArthur attends to the infrastructures which organise our personal and professional lives, infusing her work with complex social dynamics, social anxieties and authorial hierarchies. The exhibition is hot. Dotted around the gallery space, like spotlights, are small red heaters. The temperature in here has surpassed the comfortable, it’s almost sweat-inducing. It’s the kind of heat that makes you think twice about the blouse you chose to wear, which is now clinging to your body. 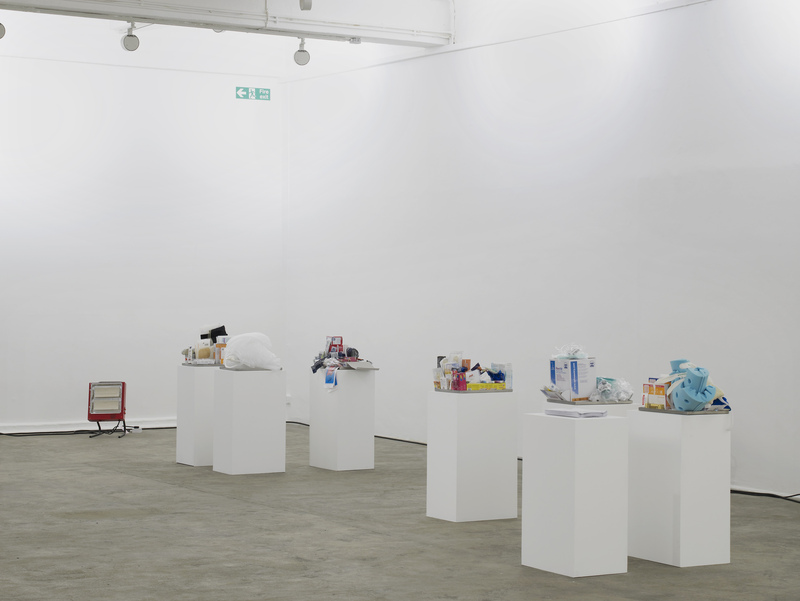 One of the pieces, ‘Contact’ (2016), is presented on low plinths, with six stainless-steel trays overflowing with single-use items like condoms, dental dams and finger condoms, moisturizers and lubricants.They are branded – ‘Allevyn’, ‘Glad’, ‘Durex’, ‘Sudocrem’, ‘Dr Selby’ – and free for the audience to take away. They come with the instruction to be kept well stocked and within their expiry date by the host organisation. They are extensions of the body, made to prevent infection, lubricate, soak up fluids, cushion and sanitise. Made from polymers and designed for intimate, physical contact – repeated encounters – these items signify the exchange between materials and the body, and involve a dialectic of caring and being cared-for. Notice your partner’s lap has been the same shape for some time and ask if she’d like it tight or open. The self-initiated and tailor made nature of McArthurs’ US-based ‘care collective’ is what until last May the Independent Living Fund (ILF) would have supported financially and structurally in the UK. In the US an equivalent system never existed. The ILF was set up in 1988 to fund support for people in need of support outside of institutions, enabling care as part of a community as an alternative to residential care. The UK government announced the closure of the fund in April 2014, stating that local authorities could achieve the same outcomes as the ILF. This much-criticised legislative decision prompted McArthur to include a letter from the ILF to the people affected by the ruling, as a takeaway in the exhibition. In a 1966 essay published in Artforum, Rosalind E. Krauss discusses Donald Judd’s work ‘Untitled 1965’, which is composed of a long aluminium bar from which shorter bars, treated in purple enamel, protrude. It is only from a side view that the bar is revealed to be hollow, an observation which prompts Krauss’s analysis. ‘The work,’ Krauss writes, ‘cannot be seen rationally, in terms of a given sense of geometrical laws or theorems evolved prior to the experience of the object, but instead adheres to a “lived perspective”.’ The experience of the work is durational, spatially evolving through a series of viewpoints that Briony Fer would later describe, in her essay ‘Judd’s Specific Objects’, as cancelling each other out. This very durational quality is what led Michael Fried – in his celebrated reaction against minimalism, ‘Art and Objecthood’ – to call the work by Judd and his peers ‘theatrical’, because it depends for its effect on the physical body of the viewer and the self-conscious mise-en-scène of an encounter in a gallery space. 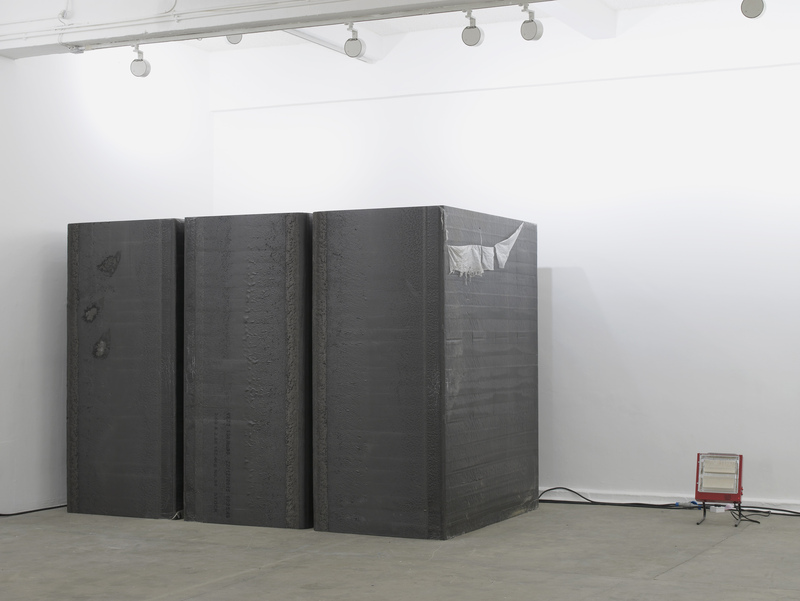 The three large, black, high-density polyurethane foam blocks in McArthur’s exhibition are sensed before being being seen. Tightly arranged to the side of the entrance, they go almost unnoticed. 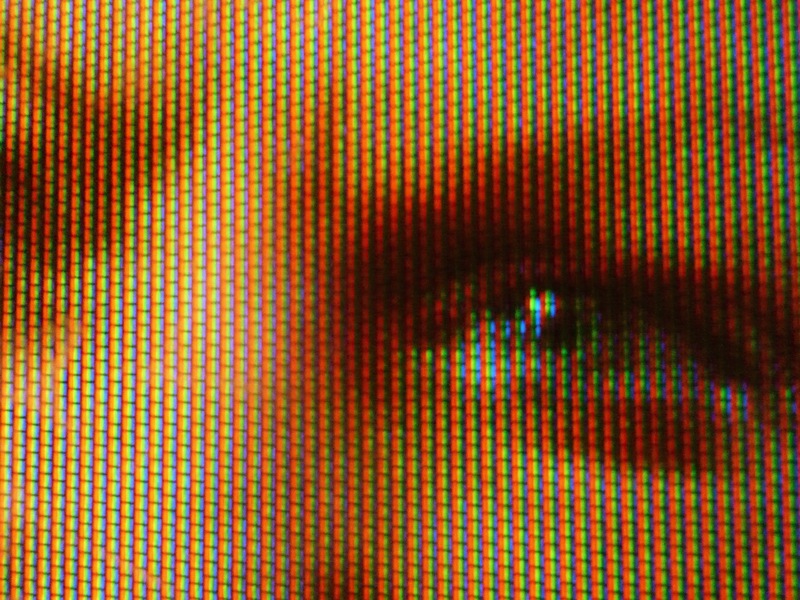 It was only on my return through the space, at a physical distance and informed by my experience of the rest of the show, that I took them in. The encounter is similar to that described by Krauss; a lived experience. The blocks, the largest size available in wholesale and designed to absorb sound or physical impact – are a riddle: light and heavy, solid yet spongy, bulky and concealed, obvious and invisible. They are experienced as much through their spatial presence as the sonic absence. 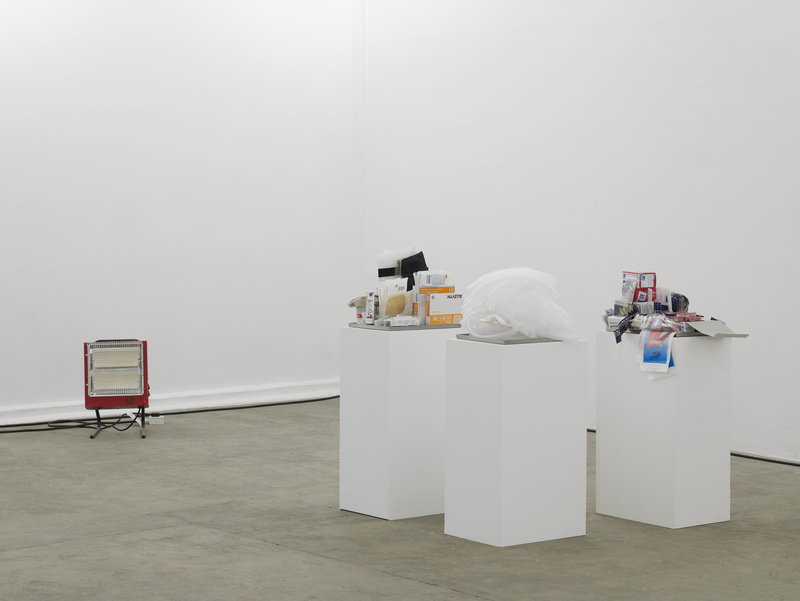 In a conversation with the Chisenhale’s Katie Guggenheim published alongside the show, McArthur states her desire to ‘exceed the visual, but also the experiential’, noting that we are not necessarily ‘able to receive all that [a work of art] is giving out’. Their position in the corner of the gallery means it is impossible to walk around or between these polyurethane blocks. It is as if they have turned their backs on us, revealing one side but concealing another, refusing obstinately to perform their full repertoire. 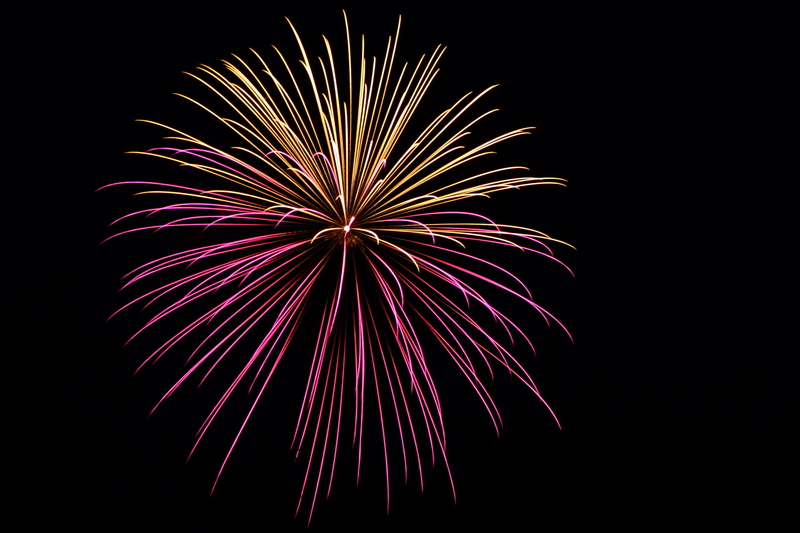 They assert that there are qualities to every experiential exchange that are not revealed to us. is a curator and writer based in Berlin.